What's wrong with being a Witness? It is rare to see one of Jehovah’s Witnesses sporting a beard, and almost unheard of in English speaking countries for a bearded brother to hold a position of responsibility. Yet the standard regarding beards has been rarely discussed in any Watchtower. 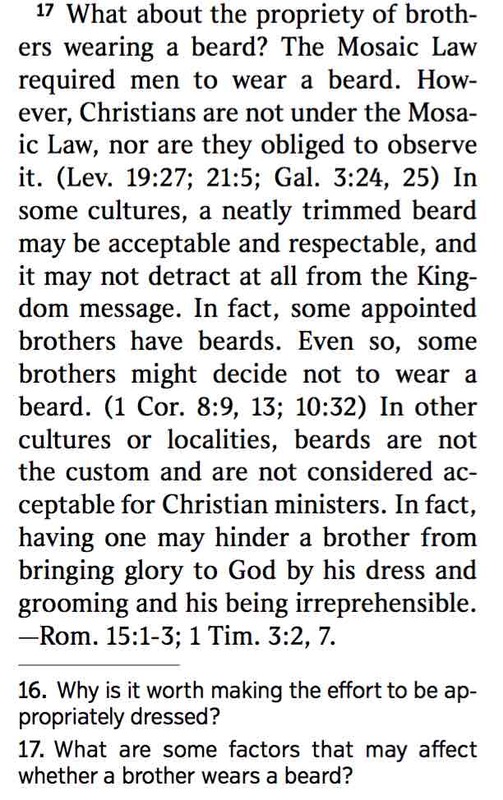 Watchtower guidance against beards is limited to vague statements about beards, anecdotes regarding people that removed their beard on conversion, and a lack of bearded Witnesses in Watchtower publications. Rather than enforced by direct decree, it has been adhered to as a result of social identification pressure. This standard extends back to the time of Rutherford. 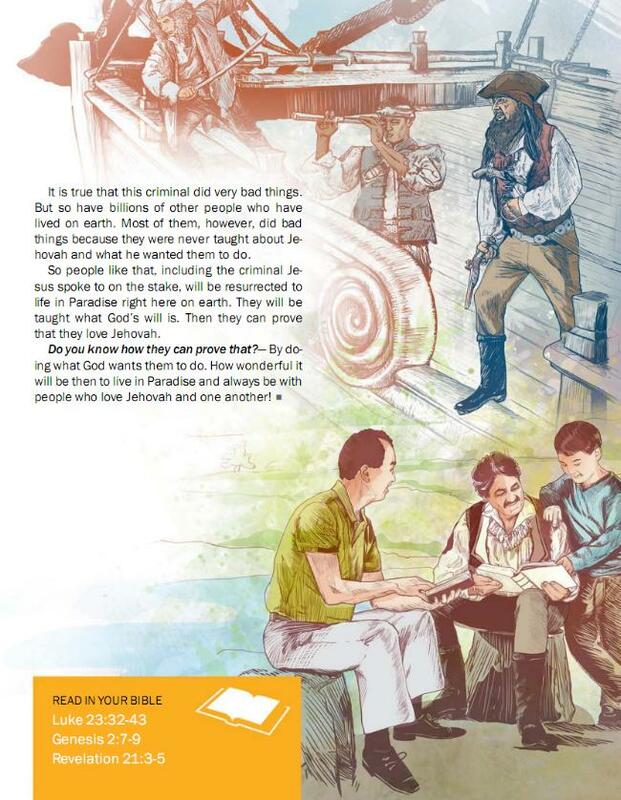 Illustrations in Watchtower publications never show a beard on modern day Jehovah’s Witnesses. 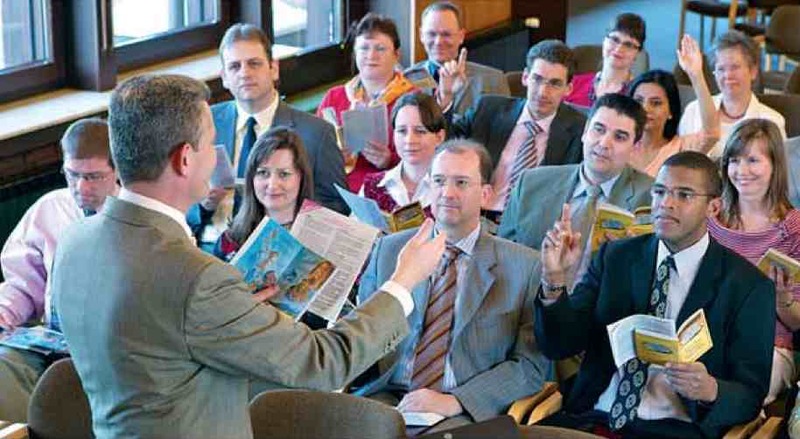 The following picture shows a typical Watchtower congregation of clean-shaven men in ties. On the other hand, if a worldly person is represented in a negative light, then it is not uncommon for a beard to be present. 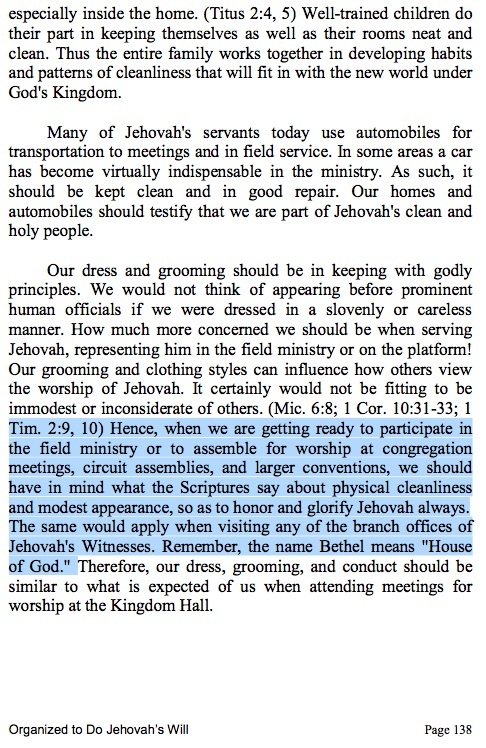 One of the few mentions of whether a beard is appropriate for Jehovah's Witnesses appeared subtly in a 1962 Watchtower. The question of whether men would have beards "again" in the new system indicates that brothers were not bearded in the congregations at this time. 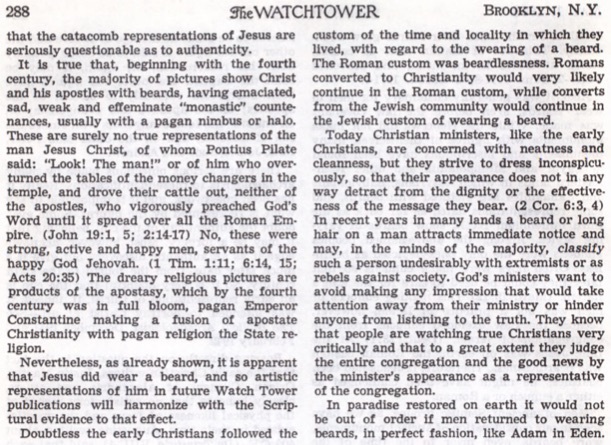 In 1968, it was directed that beards would detract from the Watchtower message. 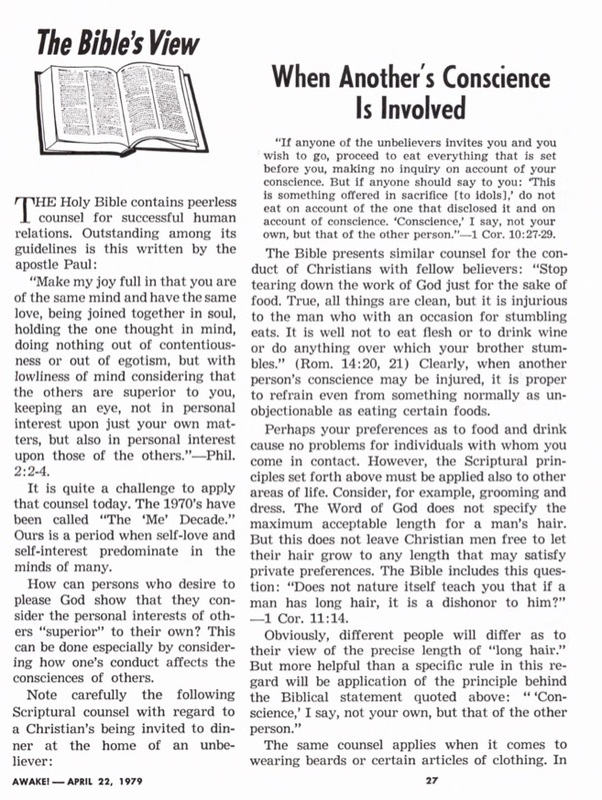 A vague directive to shave appears in the 2001 Theocratic Ministry School Book. For assignments at conventions and assemblies, specific instruction is given against using brothers with beards. “False beards should be prepared or obtained. 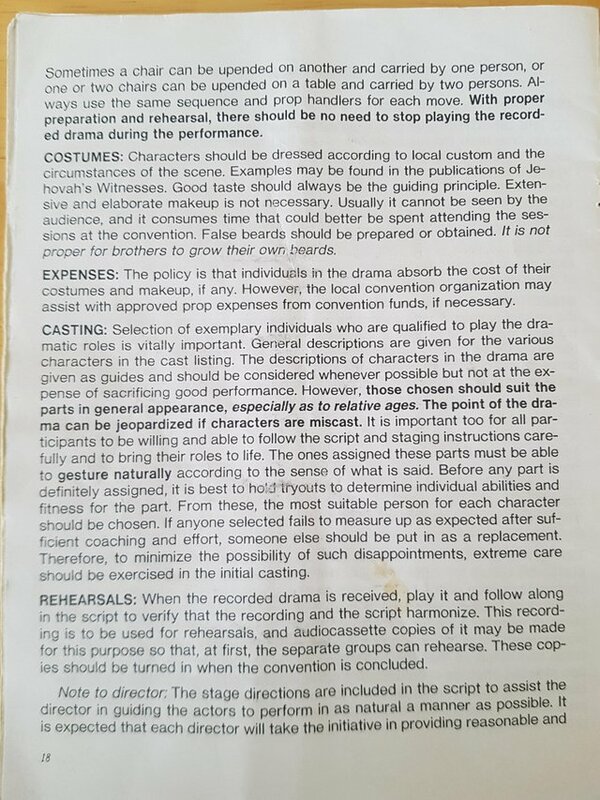 It is not proper for brothers to grow their own beards.” 2002 “Zealous Kingdom Proclaimers” District Convention Drama “Stand Firm in Troublesome Times (Jeremiah)” booklet with the script and guidelines. More common discussion regarding beards appears in the form of experiences of worldly men removing their beards on conversion. These experiences have appeared regularly over the decades, such as the following examples. 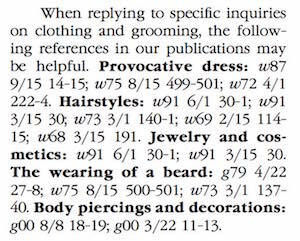 The Correspondence Guidelines (2007), page 20, includes beards under a section on appropriate attire. It points to the following articles for answers. It is strange how the 1973 Watchtower discussion against beards picks the example of how Israelite men had to have a beard. The article also said that men should not dress to appear like women. What could be more masculine than a beard? Whilst the point is that a beard is unacceptable in modern society, and Jehovah's Witnesses should not insist on their right to have one, the lines of reasoning are more effectively used to encourage men to wear a beard. 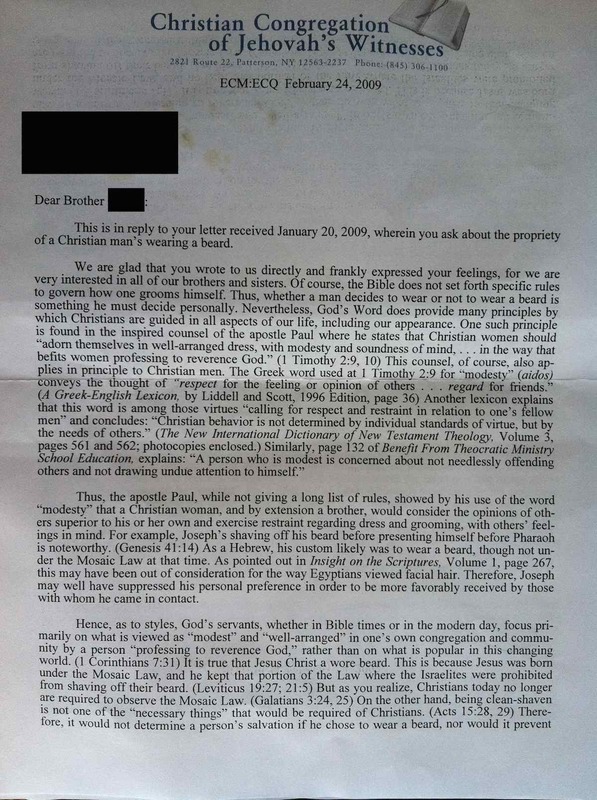 The most direct discussion I have found regarding beards is a 3 page Watchtower letter dated February 24, 2009, that was in response to a brother's personal request for information. 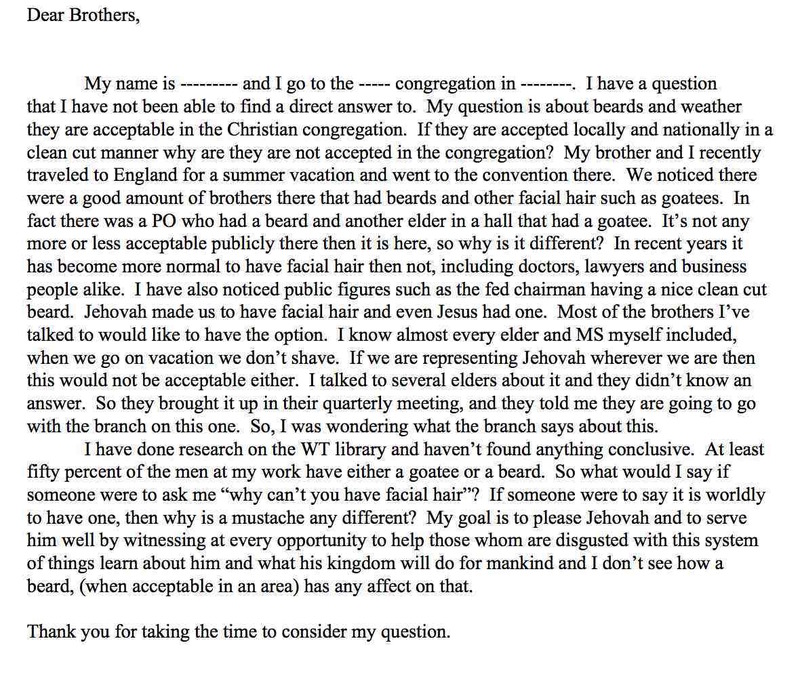 The brother writes asking what the Branch thinks about beards, since they are common on professional men and there is no direct guidance in Watchtower publications. "Therefore, it would not determine a person's salvation if he chose to wear a beard, nor would it prevent him from getting baptised, sharing in field ministry, or enrolling in the Theocratic School." Regarding positions of responsibility, it indicates a beard is not acceptable, yet in a very vague way. "... if a Christian man is "reaching out" for special privileges and yet desires to wear a beard, he might ask himself whether wearing even a neatly trimmed beard could become a matter of disturbance or controversy in the congregation. (1 Timothy 3:1) If most Christian males in a congregation or community have refrained from wearing beards for the Scriptural reasons outlined above, it is reasonable to expect that those taking the lead as ministerial servants or elders would be exemplary in this respect." 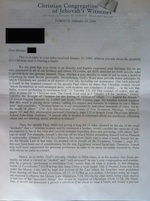 Despite showing that beards were normal attire for Christians in the Bible, and acknowledging that beards are now a common and acceptable fashion in many parts of the world, the letter concludes with the passive aggressive suggestion that "a brother who chooses to maintain a clean-shaven appearance for the sake of the good news manifests that same self-sacrificing spirit [of Timothy]." 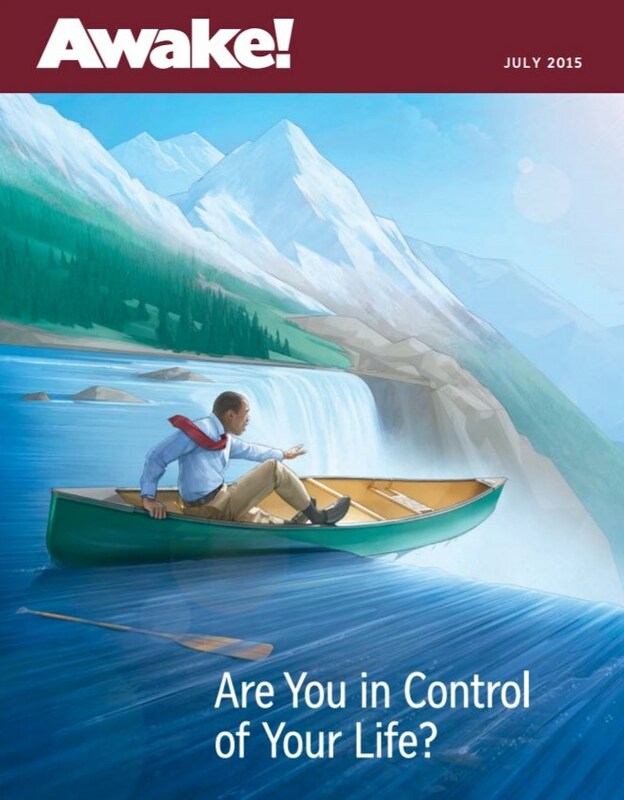 The Watchtower also uses illustrations for subliminal influence. 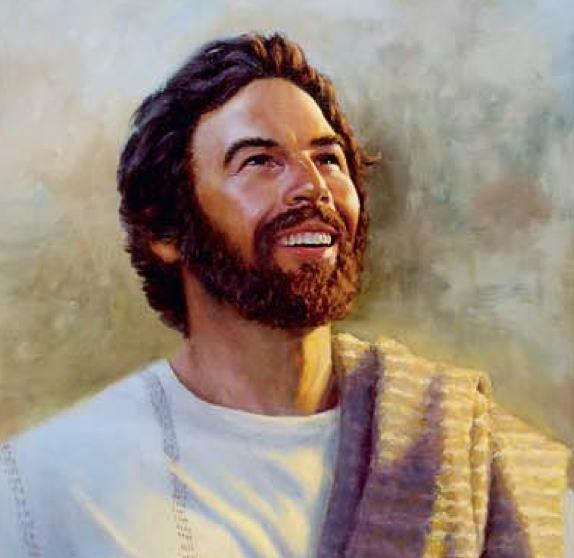 Whilst some illustrations of the "New System" include Bible characters with beards, the following examples show newly resurrected ones with beards, but as they learn God's requirements they are later clean shaven. It is unrealistic that in paradise, newly resurrected men would be expected to shave, on the basis that this is what the Governing Body understand as an acceptable standard of fashion for twenty-first century Americans. But on a base level, this picture triggers in the Witness mind that by shaving this man has accepted Bible principles, despite no Bible instruction to shave. 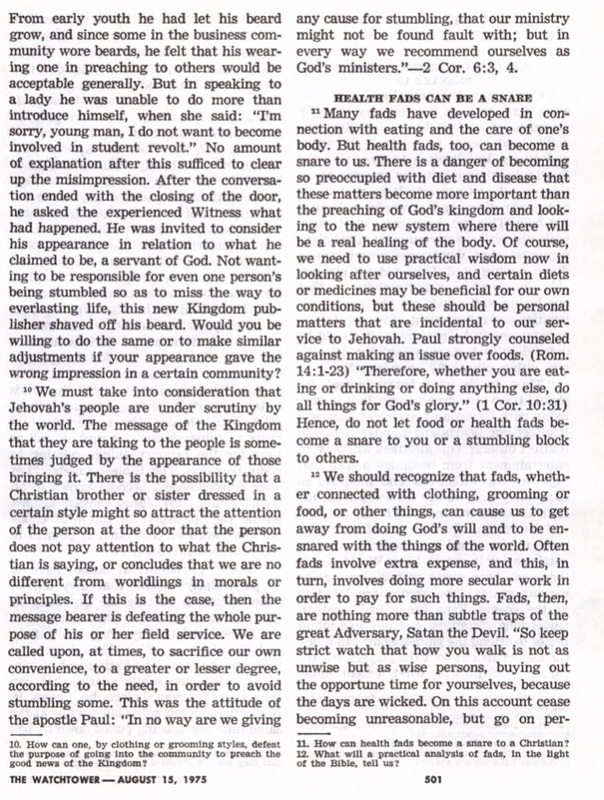 When this jwfacts article was published in 2013, Jehovah's Witnesses had been mostly beardless for almost a century. 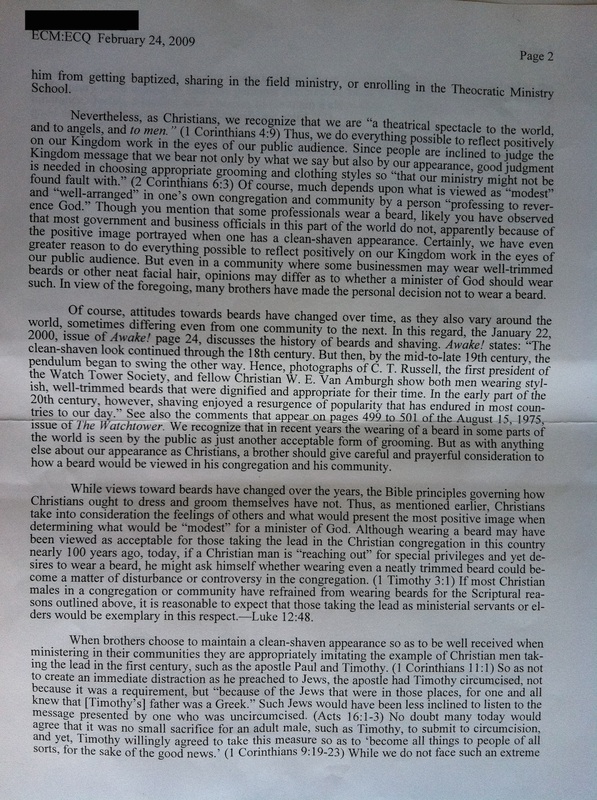 In May 2016, Watchtower released its September issue, slightly softening its stance by indicating that beards may be acceptable in some cultures. Between this jwfacts article being published in November 2013 and May 2016, it had been viewed over 44,000 times. I wonder if this was in any way influential on this statement being released. 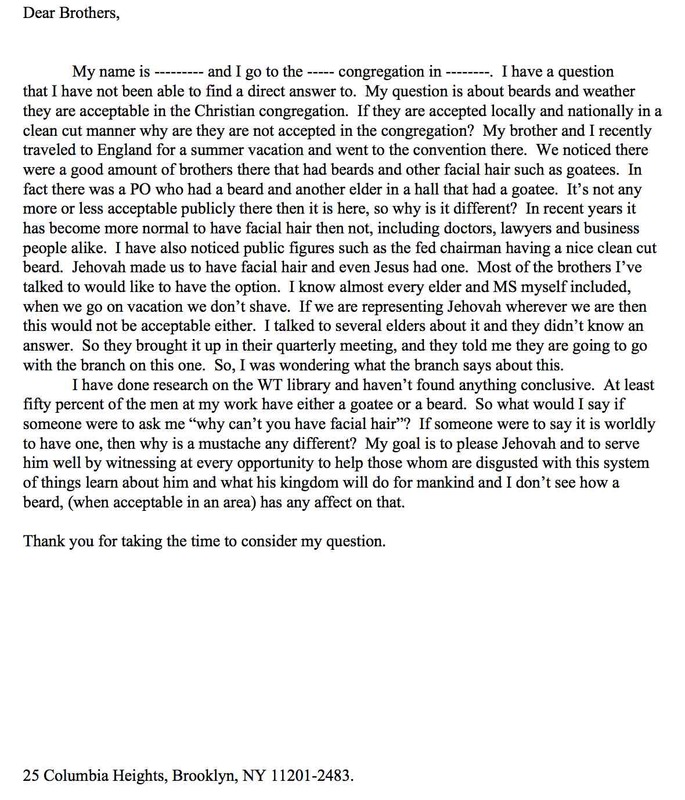 The September 2016 Watchtower states, "In other cultures and localities, beards are not considered acceptable for Christian ministers." What cultures, by whom, and why? This vagueness still leaves little room for beards, particularly where there are overseers strongly opinionated on the topic. Showing a continuing lack of comfort with bearded brothers, in a February 2018 talk Governing Body member Lett suggested that we would not want to insist on the right to a beard if it were to stumble someone. The Watchtower indication that avoidance of beards is because they are a sign of cultural rebelliousness led me to assume that this stance must have started during the hippie era of the 1960’s. However, the tide against beards had already started with Rutherford, Watchtower’s second leader. 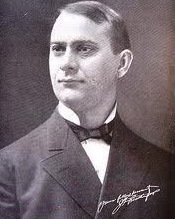 Rutherford’s clean-shaven appearance and imposition upon other brothers was a way to distance the religion from Russell’s leadership. Many did not accept Rutherford as Watchtower's rightful second leader, and Rutherford took insult with brothers sporting beards in imitation of Russell. This is explained in the book 30 Years a Watchtower Slave, recounting an experience from 1925. 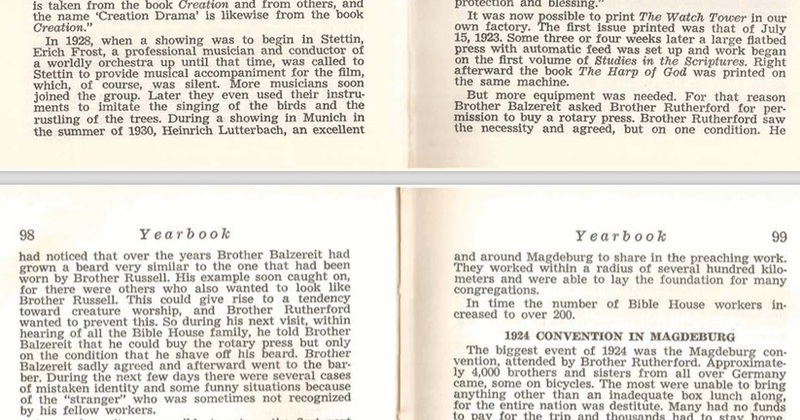 The 1974 Watchtower Yearbook verifies Schnell’s account. 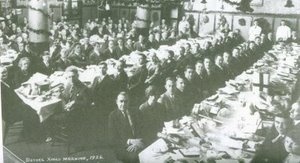 The following postcard photo of the Bethel Christmas meal in 1926 shows that by then the Bethel family were all clean shaven. It appears though that some Jehovah’s Witnesses were still sporting beards in the 1940’s, as shown in the following picture. The move away from beards were also largely influenced by fashion. Beards were common from the 1850's through to the 1920's. The prevalence of shaving aligns with the release of the first disposable safety razor by Gillette in 1903, and then electric razor, first patented in 1930. It was during this period that Watchtower followers also moved to being mostly shaven. 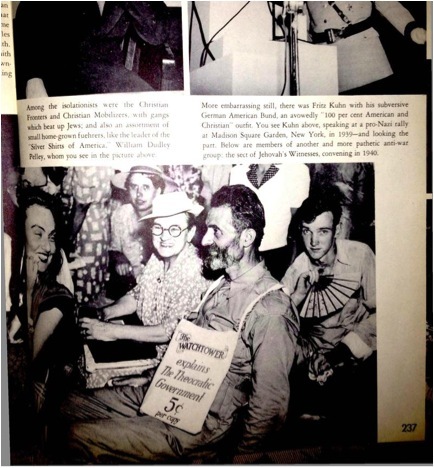 Beards were reintroduced into fashion by counterculture; beatnix in the 1950's and and then hippies in the 1960's. 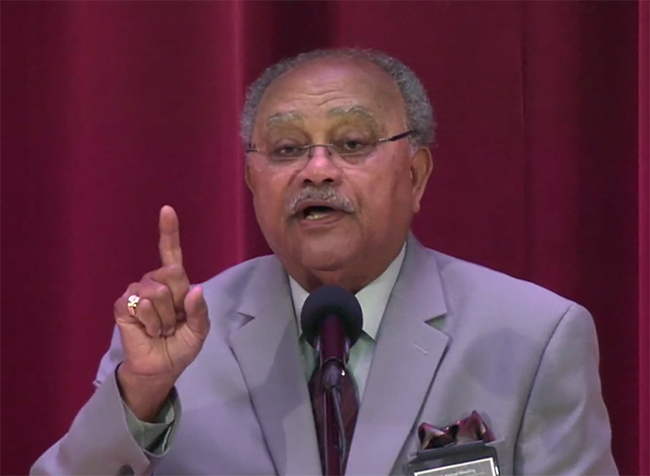 It is understandable that Watchtower leaders during that period were wary of their followers appearing to align with these groups. However, by the 1970's beards were common in the business world as well. 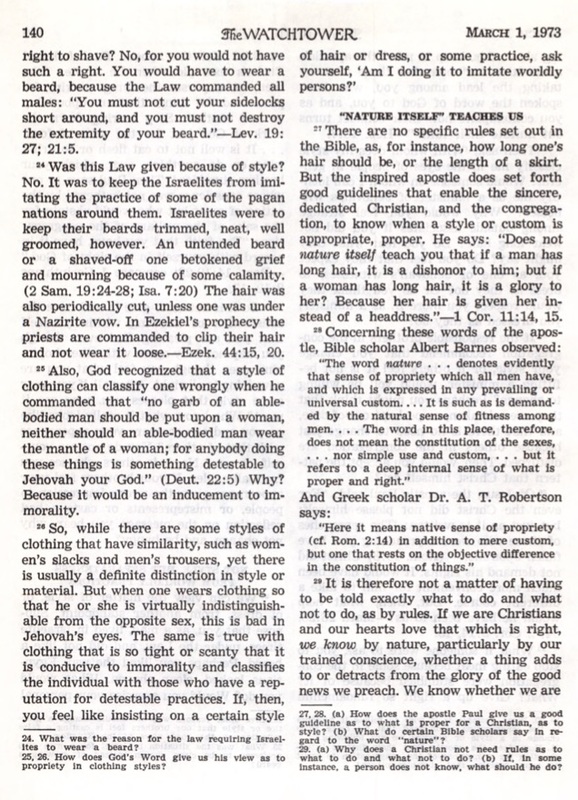 Watchtower relates the move of its followers to being clean-shaven as part of this changing fashion. What this article does not cover is that after beards became a common and acceptable part of fashion, the organization continue to condemn bearded brothers, with no support, other than the out-of-date fashion sense of the leadership. Whilst accurate that popularity of the beard vanes and rises, this reasoning does not justify placing upon it a total taboo, as a beard is perfectly acceptable in corporate Western Society. When the above quoted Awake! was released in 2000, I was dealing with corporate leaders and software professionals in Australia, and it was common for them to have beards. At the time of writing this article in 2013, the global software company I work for has many professional employees with beards. Beards are not a sign of hippies and rebellion, they appear on royalty, politicians, statesmen, international public icons and captains of industry. Yet Jehovah’s Witnesses are still expected to shave, on the baseless grounds of it being a corporate standard, and beards as being rebellious; a left over reminder of the insecurities of Rutherford and the fashion sense of the ageing American Governing Body. Between 1930 and 1968, Watchtower illustrations went as far as to present Jesus as clean-shaven and with short hair. 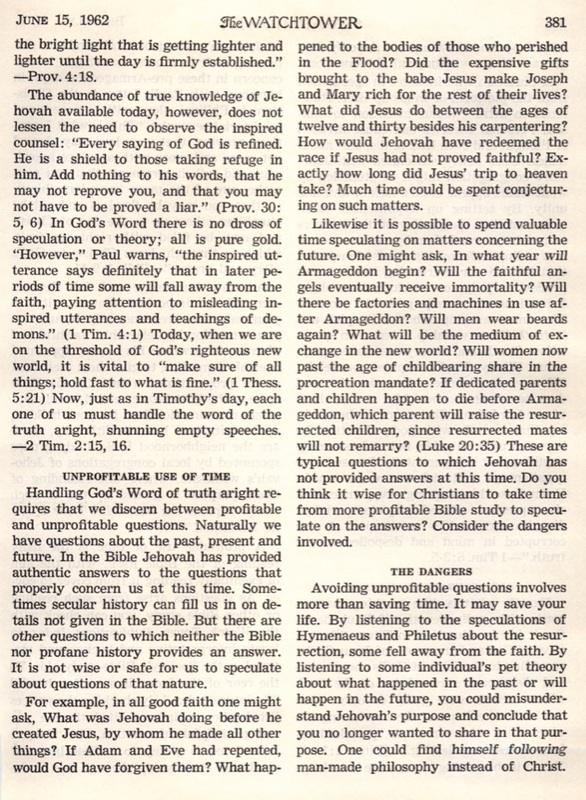 In 1954, “Questions From Readers” took two full pages to provide detailed explanation of the historical and Scriptural "evidence" of Jesus beardlessness. “The traditional picture of Jesus shows him with long hair and beard, but the Watch Tower publications illustrate him as beardless and with short hair. Which is correct? — M.H., United States. 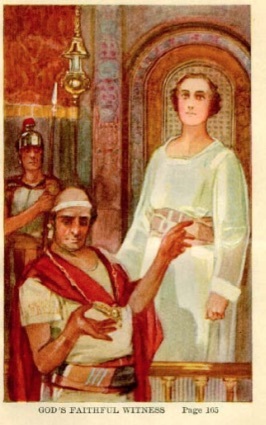 The later Watch Tower publications show Jesus as beardless and with short hair because he is shown that way in representations of him that are older than the traditional effeminate-looking picture. 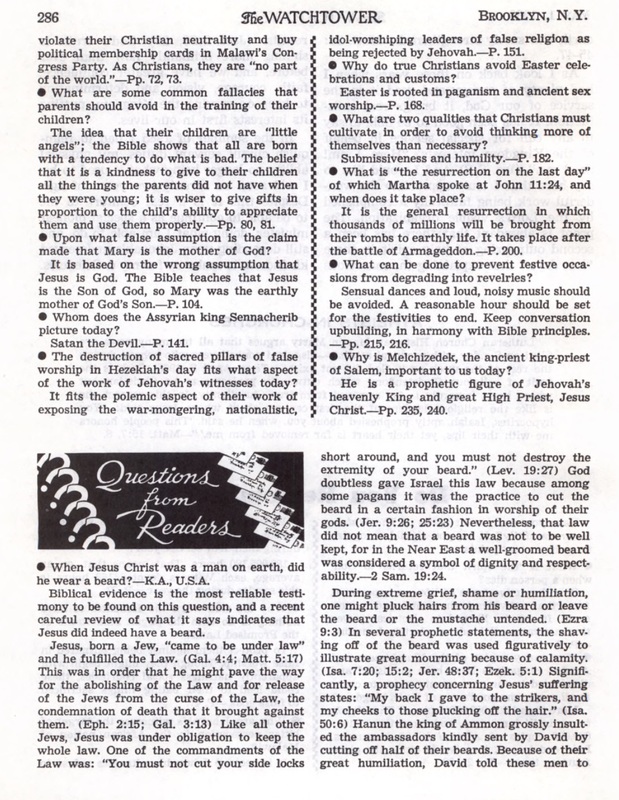 More than a decade would pass before Jesus' beard returned, with the 1968 “Questions from Readers” taking two full pages to explain the certainty of Jesus' beard. “When Jesus Christ was a man on earth, did he wear a beard? - K.A., U.S.A.
One must wonder why Bible evidence and holy spirit had led the Governing Body to the opposite conclusion when introducing “new light” against Jesus' beard in 1930, not on a whim, but with detailed reasoning, as provided in 1954. The answer is obvious; the Governing Body are not directed by holy spirit, and manipulate Bible interpretation to suit their own agenda. Common Watchtower portrayal of Jesus since 1968. The comings and goings of Jesus' beard reveals how the Watchtower selectively manipulates information to their means. 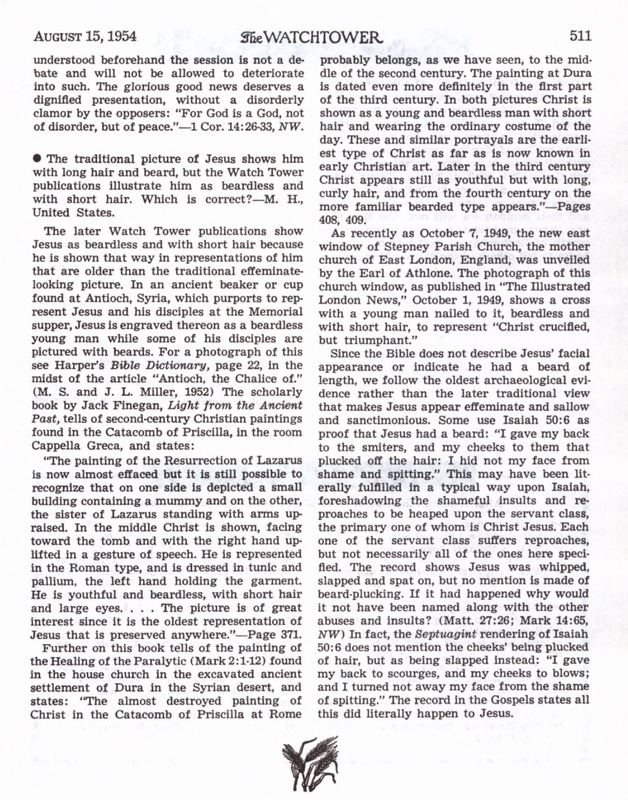 The 1954 “Question From Readers” went into great detail to prove that Jesus did not have a beard, yet in 1968 a similar level of detail was able to prove to Jehovah’s Witnesses that Jesus did have a beard. Scriptures are forced for meaning. A good example of this is how Watchtower uses Leviticus 19:28 to argue that a tattoo is inappropriate for a Christian, but ignores verse 27, which says it is wrong to shave a beard. Leviticus 19:27,28 “‘You must not shave the hair on the side of your head or disfigure the edges of your beard. 28 “‘You must not make cuts in your flesh for a dead person, and you must not make tattoo markings on yourselves. 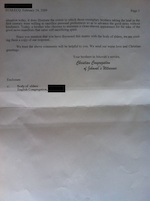 Notice how Watchtower presents that the Mosaic Law's prohibition against tattoos still lends weight for Christians. Whilst claiming Leviticus 19:28 to be significant when Christians decide against getting tattoos, verse 27 is treated as irrelevant when Watchtower directs followers to cut their beards. Men naturally grow beards, being the design of God. The Bible provides the example of Israelite and Christian men with beards, as a guide for us to follow today. The Mosaic Law forbade people from shaving (Leviticus 19:27), highlighting God’s feelings against men being clean-shaven. Shaving is effeminate and a homosexually inspired, androgynous fashion. "I grew a beard while an elder in the United Kingdom, conscientiously, having scoured the Watchtower library for every reference to beards, moustaches, facial hair, and grooming. I was promptly told that we don't have beards. I explained that I'd made a conscientious decision and that I was sorry you're stumbled brother but I couldn't find anything in the Watchtower or the Bible that said I couldn't, apart from the clearly hippie-inspired article which was easily dismissed. I was told that if I insisted on keeping it they'd have to ring ahead to the next three congregations I was giving public talks at to see if it was an issue with them, and if it was then I wouldn't be able to go. Two of the three didn't have a problem with it, but one did. It was made clear to me that I was creating an issue regarding not valuing privileges if I obstinately stuck to my hairy principle. So I capitulated. My question would be, "where are elders told to do this? To ring ahead to congregations where public talks are to be given? Because in my ten years as an elder I wasn't made aware of this directive, and I never read it in the elders letters or the elders book." "I got baptized as a teenager and never really questioned what I was being taught. But, due to skin and nerve problems, shaving is difficult for me, so when I was 21 I grew a beard. And now, nearly 20 years later, I still have it. Some Witnesses have obviously given me a really hard time about having a beard, but overall, most in my congregation don't say anything about it anymore because I've had it so long and they are used to it. As far as responsibilities in the congregation go, I generally don't have any, but occasionally I am given something to do, usually for a brief period of time before its taken away again. That's always bothered me, but I didn't blame the organization for any of it because I thought it was just the fault of overly judgmental individuals. That is, until this last summer. At the regional convention, my wife and I were originally asked to help with cleaning for an area that the congregation was assigned. We agreed to help. Cleaning is something that has never been restricted for me, so I didn't think it would be this time. But I was wrong. About a week before the convention, I was told that I wouldn't be allowed to help clean after all. When I asked about it, I eventually found out after talking to several brothers, that there was a letter from the branch about it. 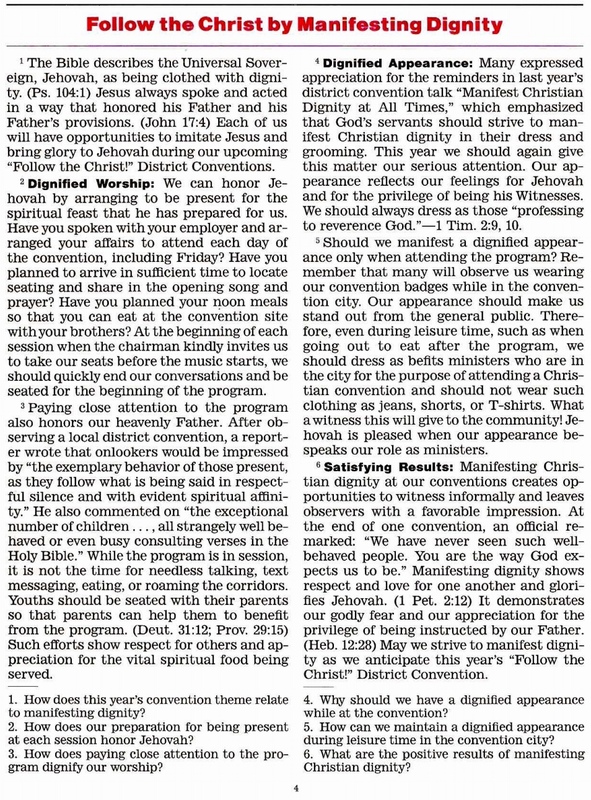 I was told that the letter didn't go to the congregations, but to the convention committee and I was told that it stated that no brother with a beard is allowed to help out in any department in any capacity before during or after the convention. I was specifically told that there is no medical exception to this." Moustaches are acceptable on a Witness brother, and Watchtower publications contain illustrations of brothers in good standing with moustaches. 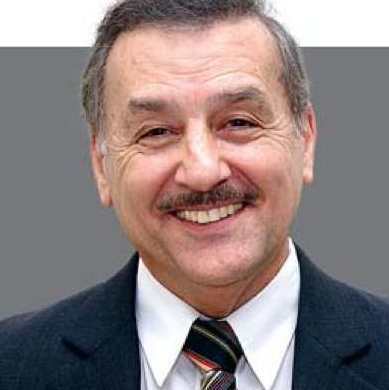 Samuel F. Herd became a member of the Governing Body in 1999, and sports a moustache. Beards are not the only area of grooming controlled by Watchtower. Attire at meetings and when preaching is strictly regulated, expected to be modest business attire. Requiring brothers to wear business attire to meetings and when preaching includes wearing a tie. The expectations go beyond modern corporate standards, as most corporate positions no longer require a tie. 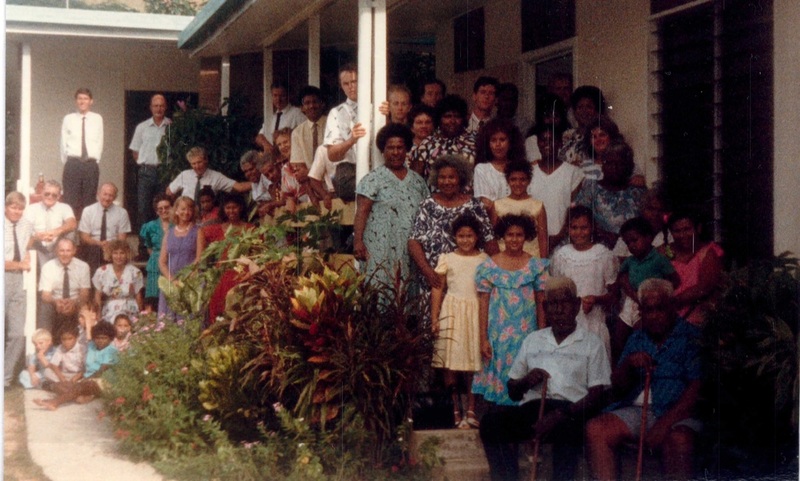 When I was living on sweltering, tropical Thursday Island, at the Northern tip of Australia, we were expected to wear a tie when on congregation duties. The local bank manager commented that this was inappropriate for the region, and no one at the bank was expected to wear a tie. 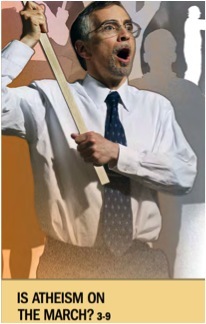 If you look at the opening Watchtower image, all the brothers at the kingdom hall are wearing a tie. 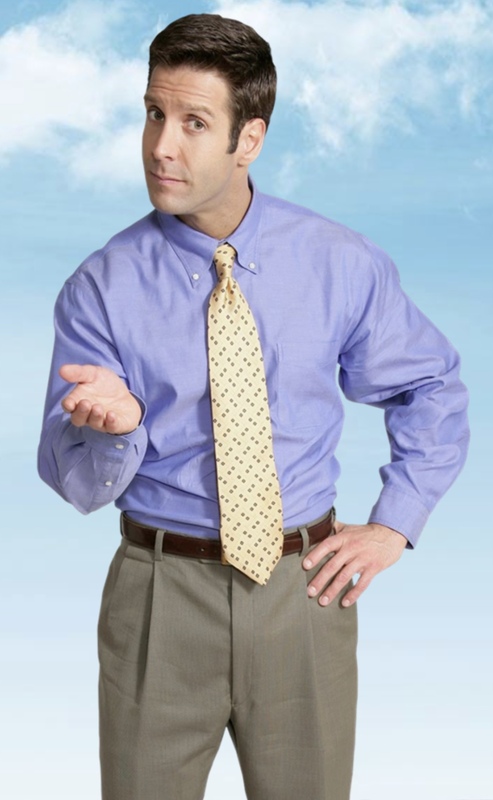 It is ironic that in many countries Jehovah’s Witness men are forced to wear a neck tie to meetings, when the tie violates so many Watchtower principles. The necktie is fashion industries great joke. It is one of the few items of clothing that serves no useful purpose, yet is costly and uncomfortable to wear. The fashion industry convinces men to continually update with the fashion, changing patterns and widths annually, with sales peaking at $1.3 billion dollars in 1995. Why Do Men Wear Ties Feb 3, 2017. Watchtower criticises being “slaves to fashion,” and then forces men to follow the most pointless of all male fashion. On rare occasion, a tie may add to the appearance of a well dressed person. 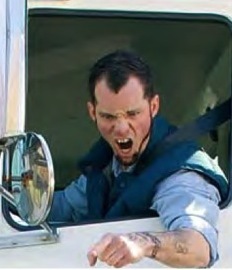 In most cases, ties are an unnecessary, dangling eye-sore; an occupational hazard for a shredding machine. Ties are no longer business attire, except in the most seedy professions, such as used car salesmen, insurance salesmen, along with politicians. I am in an IT role, meeting C level executives on a regular basis, and few ever wear a tie in this day and age. 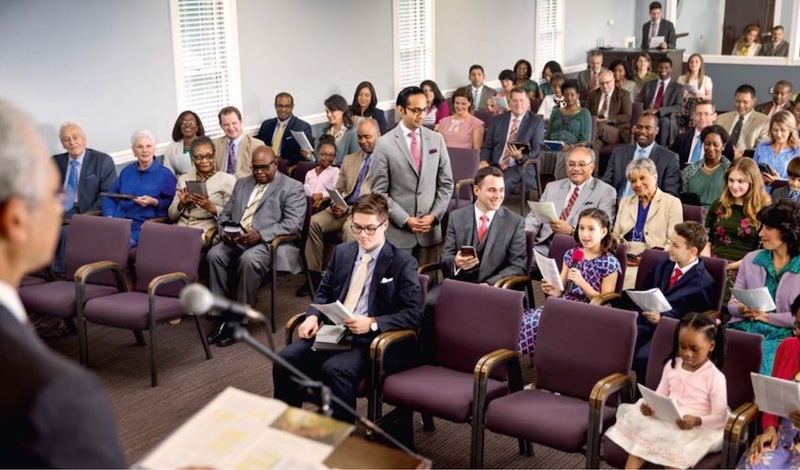 The 2018 book release Pure Worship of Jehovah presents a congregation photograph, portraying the standard continues to be beardless males in suits and ties. Even engaged in casual sporting activities, Watchtower depicts Jehovah's Witnesses following their excessive and inappropriate standards on dress. Visitors to Bethel are to abide by the same strict code as when attending meetings. 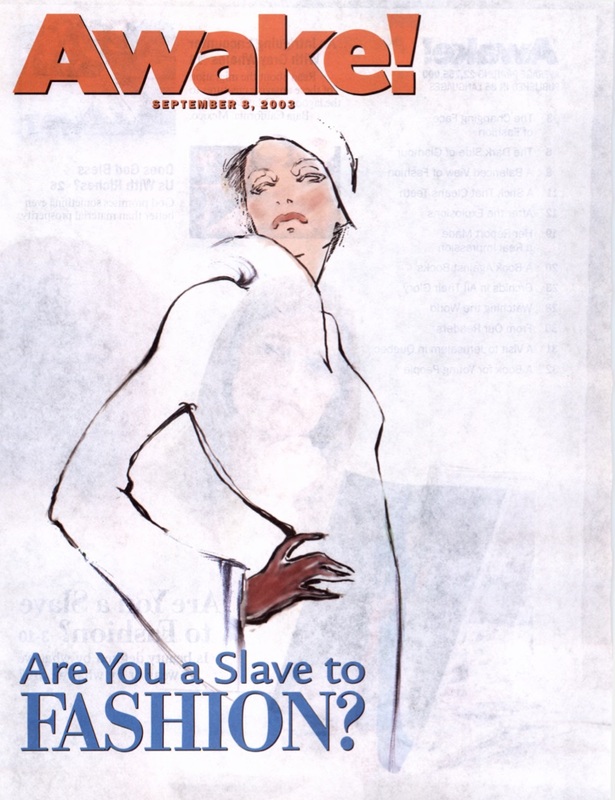 As illustrated in the 2008 brochure Dress & Grooming for Visitors Touring Bethel, collared t-shirts are not considered appropriate for brothers visiting bethel. This is an excessive level of control, considering Bethel is predominantly an office and printing factory. Sisters face the same controlling attitude towards fashion, being expected to wear modest dresses or skirts to the Kingdom Hall, Bethel and preaching, but not trousers. This is counter-intuitive, since formal business slacks are common corporate attire, and more modest than a dress. The "metrosexual" fashion of "extremely tight pants" came under attack by Governing Body member Anthony Morris during a comment to Rome Bethel on 20th Jan 2014 as a disgusting homosexually inspired fashion. 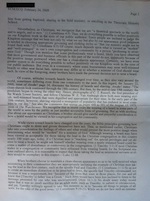 The Circuit Overseer program for elders in 2015/16 contained a section explaining that brothers sporting a metrosexual look of tight fitting clothing, or sisters with revealing or tight clothing, are excluded from qualifying for Bethel, and may even be excluded from preaching in the ministry work. 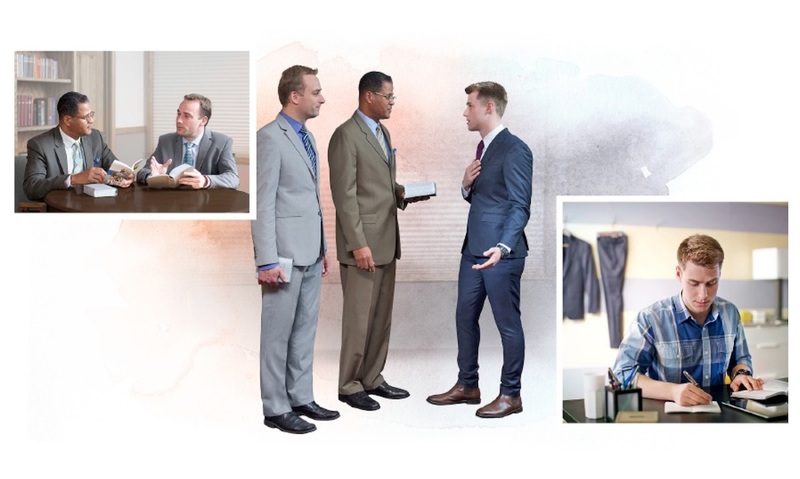 The Watchtower 2016 June study edition shows elders counselling a brother in a business suit, because the cut of the legs is considered too tight. 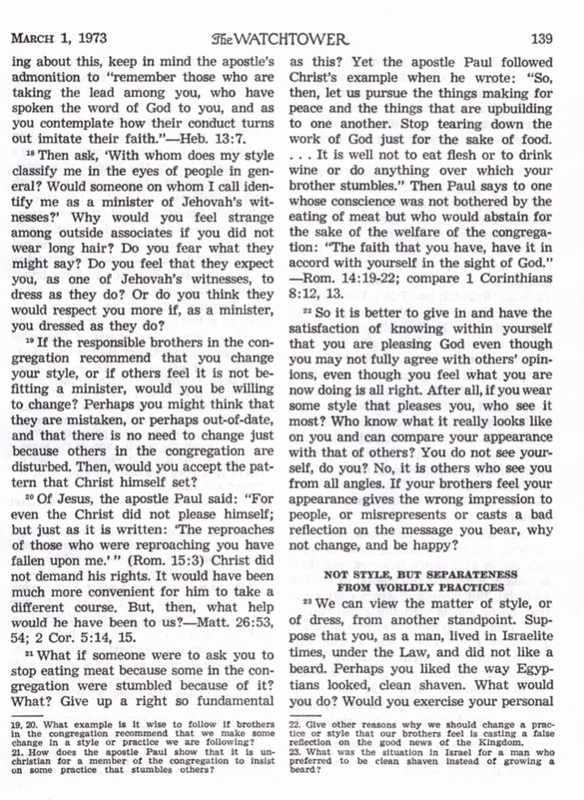 The September 2016 Watchtower article "Does Your Style of Dress Glorify God?" 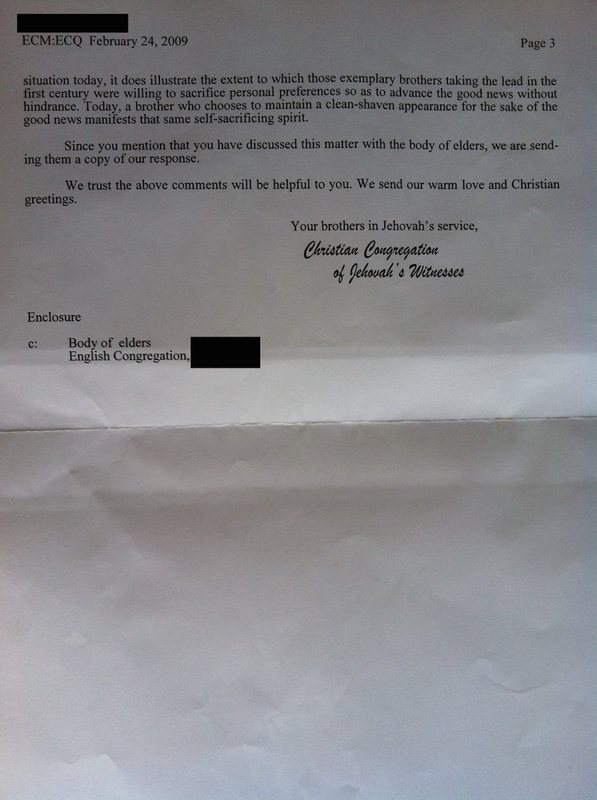 ironically states Jehovah's Witnesses should feel grateful they are not be burdened with detailed regulations on clothing. 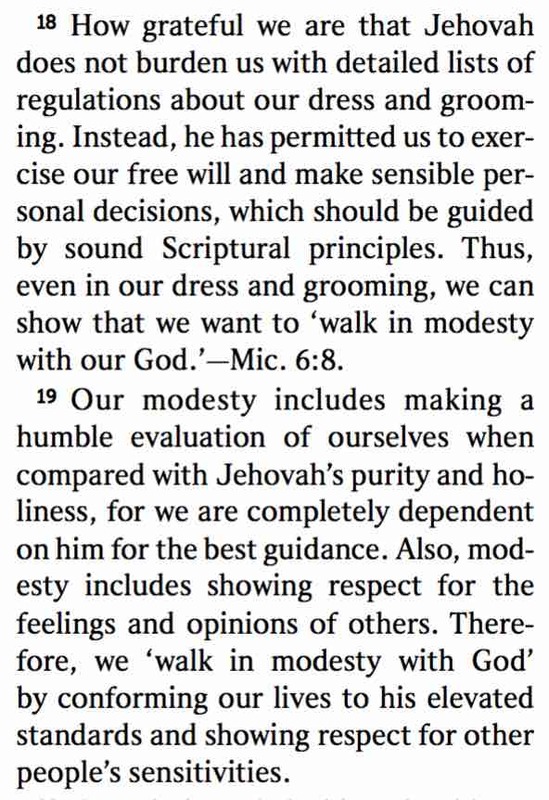 This is a surprising statement, considering how pedantic and controlling Watchtower is regarding dress and grooming. In fact, the true irony is that the article had just presented a list of regulations about dress and grooming. The excessive concentration on clothing extends to children. 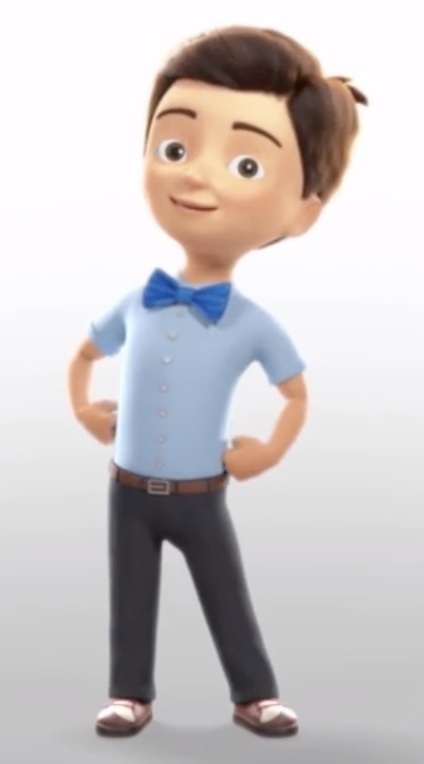 The children's cartoon	Be Good in the Ministry discusses clothing appropriate for Jehovah's Witness children when preaching. Tony Morris' strange obsession with tight pants carries over into this video, sexualising young Jehovah's Witness children with the out of place comment that they should not be wearing clothing that are too tight. The image of appropriate clothing for children when preaching is to wear a bow tie. Is a bow-tie on a child cute, clown-like, or a century out of fashion? Excessive behavioural control is an indication of a totalitarian regime, and common amongst religions using persuasive coercion. I have read experiences of brothers being marked for refusing to shave their beard, and in one of my congregations a brother in his fifties was told he would not be made an elder for as long as he refused to shave his beard. I have known a very small number of Jehovah’s Witnesses who had beards, such as one friend who claimed he could not shave due to a skin problem, but in Australia I never met an elder or pioneer with a beard. Throughout the entire history of the Bible, God's followers wore beards. 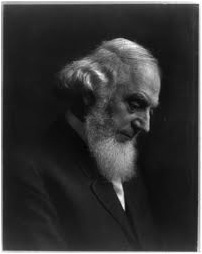 Jesus would have had a beard, as did Watchtower founder, Charles Russell. It is remarkable Watchtower feels justified to shirk Bible examples when imposing such rigid control over its member's choice of fashion, and that congregations of beardless men are so universal amongst Jehovah’s Witnesses, simply through subtle Watchtower suggestion. This exemplifies the level of peer pressure Witnesses undergo to conform. This excessive control that goes beyond, or even against, Biblical examples, brings to mind several Scriptures. Beards a Harmless Fashion - A clever satire showing how Watchtower could introduce "new light" that brothers should grow beards. Written November 2013, latest update October 2018.